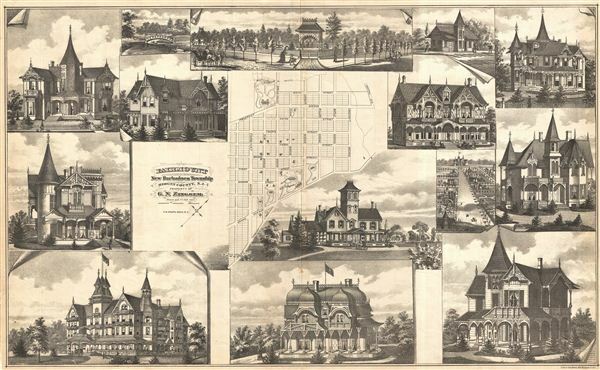 Exquisitely detailed and charming lithographic views of various unnamed buildings surround a map of Fairmount, New Barbadoes Township, New Jersey. Most of the views focus on the properties and lands of G. N. Zingsem, the architect renowned for designing Fairmount Park in Philadelphia. Today Fairmont enjoys an unusual diversity of flora due to Zingsem's importation of various Elms, poplar, Cedar, and Capalpa trees into the region. The grand Fairmont Hotel, destroyed by fire in 1925, appears in the lower left quadrant. An almost identical map without views graces the verso. Published in Walker & Pease' exquisite 'topographical, illustrated, historical, descriptive' Atlas of Bergen County, New Jersey, 1876. Good. Even overall toning. Original centerfold exhibits some wear and in verso reinforcement. Minor discolorations here and there. Edge wear mostly confined to margins. One large repaired tear from left margin extinding 2 inches into page.